Add a desirable contemporary style to your corner shower allotment with Aston Neoscape completely frameless neo-angle shower enclosure. Available in a variety of width / length models - from 34 in. to 42 in. - the Neoscape will instantly upgrade your bath. All models feature 10mm ANSI-certified clear tempered glass, stainless steel or chrome finish hardware, self-centering hinges,premium leak-seal clear strips and its reversably enginered for left or right hand installation. All models come with a 5 year warranty, standard; base not included. The Aston Orbitus Completely Frameless Bypass Round Shower Door Enclosure is an engineering masterpiece that will instantly upgrade the style and feel of your bath. 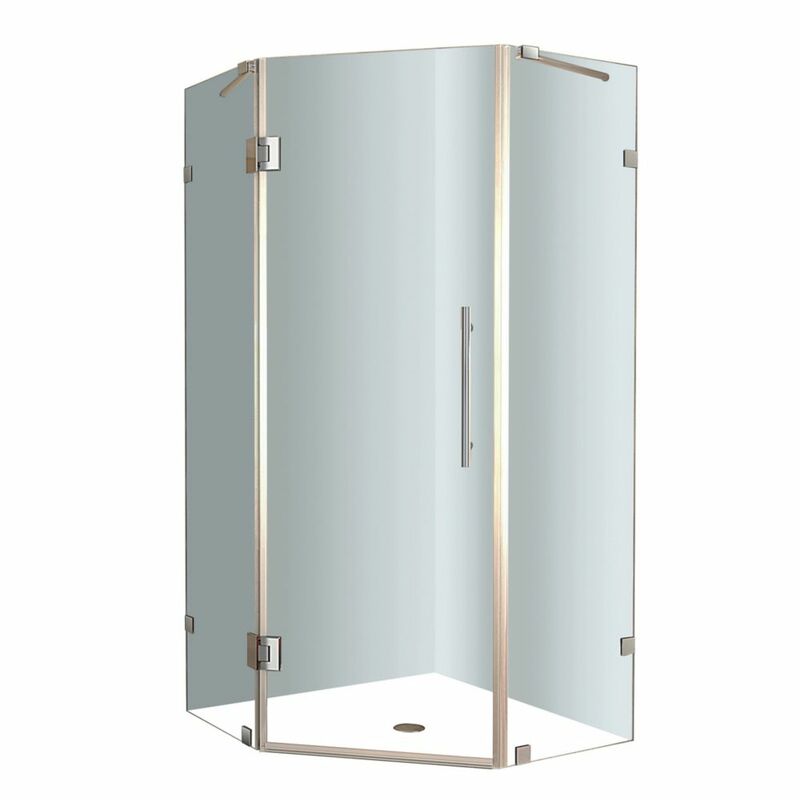 This completely frameless shower enclosure is constructed of durable 5/16 in. ANSI-certified tempered clear glass and includes a stylish round top support bar for anchoring and stability as well as deluxe clear seal strips to prevent leakage. This luxurious right handed door opening model comes with your choice of either chrome or stainless steel finished hardware and can be equipped with a matching 2.5" low-profile acrylic fibreglass base. This model does not include the shower base. With an integrated design, beauty and functionality the Aston semi-frameless SD908 36 in. x 36 in. x 77.5 in. round bypass shower sliding door enclosure with matching base is the ideal shower solution. With features including 5mm ANSI-certified premium clear glass, your choice of either stainless steel or chrome finish hardware and magnetized door channels, this enclosure portrays beauty and functionality on a budget. This model includes the matching 2.5 in. fibreglass-Reinforced White Acrylic Shower Base. A modern space-saver by design, the Aston SEN973 38 in. x 38 in. x 77.5 in. neo-angle semi-frameless luxury shower enclosure with matching base defines design, functionality and quality. By adding a luxurious corner focal point, with the premium 10 mm ANSI-certified tempered clear glass, choice of chrome or stainless steel finish, reversible door configuration, built-in towel bar handle and minimal hardware will not go unnoticed. Make your showering experience a luxurious getaway every time with this beautiful, contemporary enclosure. This model includes the 2.5 in. low-profile acrylic fiberglass-enforced matching shower base. Neoscape 34-Inch x 34-Inch x 72-Inch Frameless Shower Stall in Stainless Steel Add a desirable contemporary style to your corner shower allotment with Aston Neoscape completely frameless neo-angle shower enclosure. Available in a variety of width / length models - from 34 in. to 42 in. - the Neoscape will instantly upgrade your bath. All models feature 10mm ANSI-certified clear tempered glass, stainless steel or chrome finish hardware, self-centering hinges,premium leak-seal clear strips and its reversably enginered for left or right hand installation. All models come with a 5 year warranty, standard; base not included.